A few causal drivers of democratization have dominated the literature: slow-moving processes associated with modernization, elite pacts such as those in Chile or Spain, and, more recently, international drivers. Evidence for “change from below” linked to protest in Africa in the work of Michael Bratton and Nicholas van de Walle (Democratic Experiments in Africa: Regime Transitions in Comparative Perspective [New York: Cambridge University Press, 1997]). Despite dismal setbacks in the Middle East since the Arab Spring, scholars such as Erica Chenoweth and Maria J. Stephan (Why Civil Resistance Works: The Strategic Logic of Nonviolent Conflict [New York: Columbia University Press, 2011]) have revived some of this logic, offering evidence that “civil resistance” as a tactic is effective. 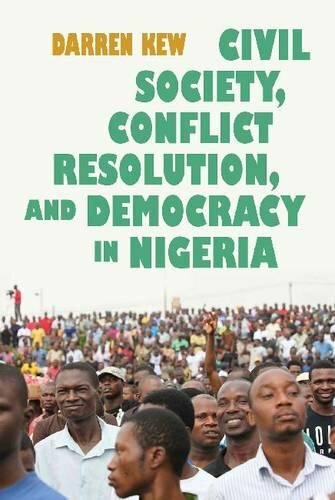 In his thoughtful new book on Nigeria, Darren Kew advances the study of democratization by keeping the focus on civil society, as in these other works. He breaks new ground by delving into the internal dynamics, governance cultures, and structures of civil society organizations (CSOs). Organizations with more democratic structures promote democratization because they facilitate a binding social contract with their members, while those with democratic cultures spread the “right” values. Kew explains in later chapters how some effective CSOs in the 1990s were actually hierarchical. He also ably navigates a complex family tree for Nigeria newcomers, using privileged access to CSO leaders to account for important junctures, such as critical splits among human rights groups. More than a decade of research provides deep histories of labor unions, religious organizations, and community-based organizations. The epilogue offers an excellent, lengthy overview of politics since 1999. One major contribution is to generate a fruitful dialogue between political science research on democratization and conflict studies. Kew defines civil society as “the dynamic, organized social realm delineated by the political culture of a political system for public action outside of but interactive with the state realm” (p. 28). The rich discussion around the concept is situated alongside pertinent classics such as John W. Harbeson, Donald Rothchild, and Naomi Chazan’s Civil Society and the State in Africa (Boulder, CO: Lynne Rienner, 1994). Another contribution is Kew’s organization of civil society into three “generations”: traditional institutions, religious institutions, and ethnic associations made up the first generation. Because of their “neutral orientation toward the state,” few of these groups actively agitated for democracy (p. 155). The second generation was populated by unions, student groups, business associations, and the media, which together led the fight against the dictatorships of the 1980s and 1990s. The third generation brought the rise of nongovernmental organizations, including many hierarchically structured groups that deftly navigated the donor landscape, capitalizing on (sometimes shallow) donor enthusiasm for the grass roots. There are a few other elements of Kew’s framework worthy of skeptical (but very collegial) queries, which might orient the book on course syllabi. First, one of Kew’s goals is to demonstrate that the mere density of ties is insufficient to explain whether civil society promotes democratization. Although Shari Berman is cited, the well-established idea of “bridging” social capital is missing; this potentially important organizational trait brings together different communities (or perhaps ethnicities). Second, part of the theory centers on civil society’s role in changing values. Yet Kew makes limited use of available survey data on values, and some political scientists might seek further details about the mechanism that actually transits the values. Third, given the importance of democratic cultures in spreading values conducive to democratization, one might question why Hegel wins so many of the arguments with Tocqueville in the book. Kew is more than a concise writer with a thorough grasp of evidence and comparative ideas—he elevates the arguments without ever sounding argumentative. This great work will provoke practitioners and could help educate the next generation of democracy activists.